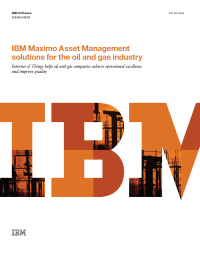 Download this solution brief as it examines how IBM Maximo Asset Management delivers the critical capabilities that oil and gas companies need. These capabilities range from enabling processes that record and store organizational knowledge to providing a consolidated and trusted platform for managing assets -- from the smallest tools and parts to the largest production and maintenance facilities. As technology reaches every corner of the globe, the world becomes smaller—and smarter. With global organizations and systems that are more instrumented, interconnected, and intelligent than ever, the oil and gas industries now have the potential to achieve new levels of business value and optimize operations.